Spring is here, summer will follow soon enough and you’re eager to burst the bonds of winter and explore nature with your new baby. You might wonder — what sorts of outdoor activities are suitable for the under-one crowd, and what benefits are there for your baby as well as yourself? We will clue you in on the best natural activities for your little one and what safety hazards to look out for. Your yard is an excellent place to start if you have one of your own. The simple step of getting outside and breathing fresh air is essential to curing cabin fever for yourself and can help your baby learn about different environments. Also, don’t forget that vitamin D (in the form of sunshine) is an essential ingredient to a healthy immune system. Don’t worry if the sky is overcast — you can still get a day’s worth of vitamin D in about 15 minutes. Depending on your baby’s age, you can keep her up in your arms or let her down in the grass for some hands-on exploration. Sit with her at first as she feels the cool ground. 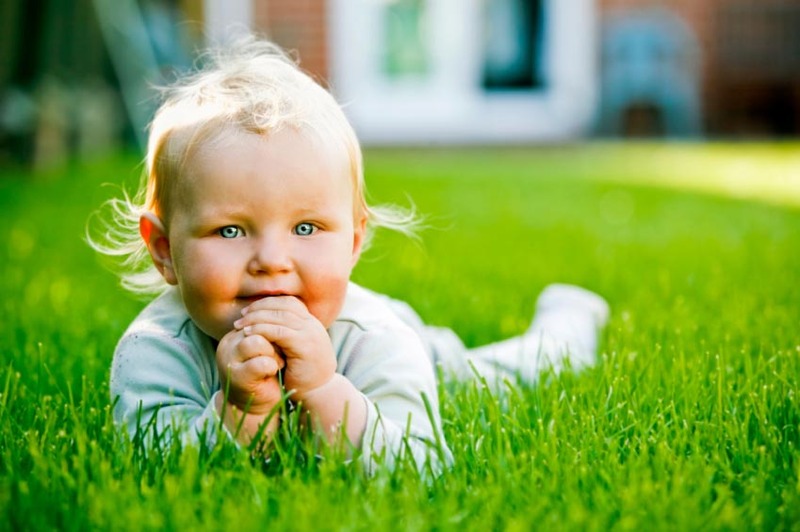 Often, babies who touch grass for the first time are not thrilled by it and may continually try to avoid its touch. Repeated outdoor visits will usually take this apprehension away and before you know it she won’t even notice it. If you don’t have a yard of your own, head to the nearest park. If this is your first baby, this is a great way to get to know the park well before your child is old enough to run around on his own. If there is play equipment suited to a baby his age, such as a baby swing, feel free to explore it at his pace. You can explore the grassy areas much like the yard at your own home or take him for a walk on a path. Nurse him under a shady tree or spread out a blanket and have a snack while he practices rolling over, sitting up or crawling. If you’re feeling more adventurous, take your baby with you on a short hike at a local park. You can use a stroller if you have one you like but even better is using a good baby carrier, like a ring sling such as a Maya, a wrap such a Moby or a Didymos or a soft-structured carrier like a Beco or an Ergo. Your baby will benefit by being close to her caregiver and exploring the outdoors from a safe and comfortable place. Choose an easy route with as few obstacles as possible and the least amount of hills to climb for your own comfort, but feel free to add more complex routes as your fitness levels rise. No matter where you are in the great outdoors, there are universal safety rules you should follow. Be on the lookout for animals — domestic or wild, pets or feral. Watch out for the sun. Six months plus, you can choose a suitable infant sunscreen, but younger than that (and optionally for older babies), go without sunscreen but stay out for shorter times for optimal vitamin D exposure. Watch out for harmful plants, unseen holes in the ground and bodies of water, no matter how small. Be sure to pack plenty of fluids for your baby if you are away from home and are not breastfeeding, and if you are a nursing mom, bring plenty of fluids for yourself. Test out any baby carrier or stroller before your excursion. Investigate any playground equipment you would like to use before putting your baby in it. If your baby’s starting to climb, check out our article, Coping with climbers. With these ideas in mind, you and your baby will enjoy the outdoors all through spring and summer — this year and every year!